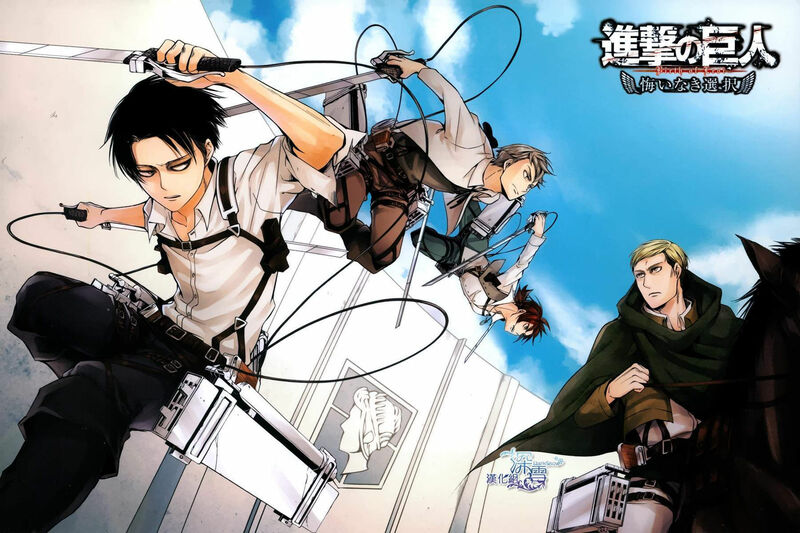 Attack on Titan’s explosive popularity has led to various spin-off series being published. From comedies to prequels, they all sounded like they’d be interesting, entertaining reads, but the one that piqued my interest the most was the spin-off titled No Regrets. It centers around Attack on Titan’s most liked and enigmatic character Levi and is written by Gan Sunaaku and illustrated by Hikaru Suruga. No Regrets was by far the one I looked most forward to reading following its announcement. The idea of seeing Levi in a different setting that delved into his life before he joined the Survey Corps seemed like a great opportunity to expand on what fans already knew, perhaps even giving them something new to consider. In the original series, Levi is well-liked for his short height, vulgar language and sense of crude humor, prowess as a powerful soldier, a unique outlook on the affects of his choices, and being a total clean freak. But besides his unique perspective on the world and his personality quirks, Levi’s past was a blank slate, a mysterious character fans knew nothing about. It seemed like a dream come true to have a spin-off centering around the fan-favorite of the original series, but despite its success, No Regrets is surprisingly short, with the last chapter expected to be released next month. After reading the most recent chapter, I found myself bothered by how much this spin-off has failed to meet my expectations. How did it fail, you ask? The answer is quite simple; this spin-off hasn’t told me anything new about Levi. At all. Yes, it’s a spin-off – a short one at that – and I realize that as such, it’s not canon. But regardless of its length, I was still expecting a different, new take on Levi’s character at the very least. 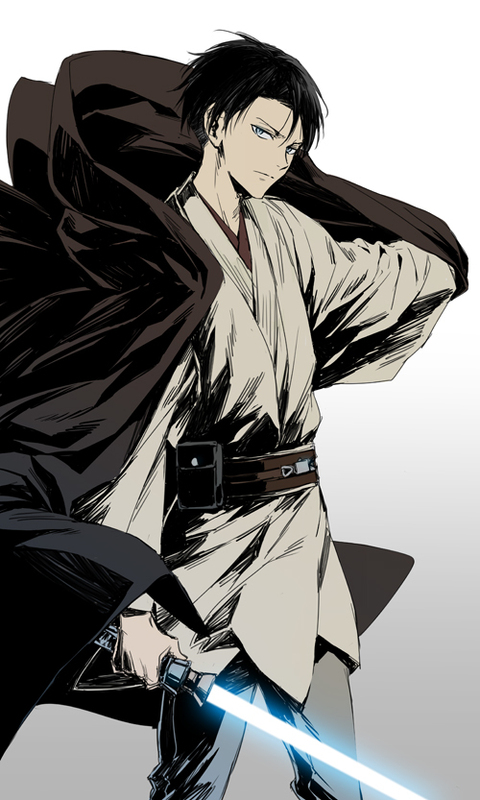 The first reason why No Regrets failed to be a good prequel spin-off for me was because it barely explored the aspects of Levi’s character that fans already know and love. His obsession with cleaning was only shown in one scene, and his vulgar language and sense of humor is not nearly as pronounced. Furthermore, in the original manga, within a few lines of dialogue, Levi’s described as being a notorious thug before joining the Survey Corps – and this too was barely touched on in the prologue and first chapter. All of his distinguishable traits were glossed over in No Regrets, almost as if Sunaaku wasn’t sure how to portray Levi, and ended up just eliminating Levi’s existing personality while undermining any potential to build on it with new developments. The things fans already knew about him aren’t made to be more interesting in a different context, and since he isn’t given any new or different character traits from the barely existing ones, he’s a rather boring protagonist in No Regrets. So much of the time, instead of making me sympathize with Levi or provide some insight into his thoughts, I felt the story and illustrations were more focused on making Levi brooding and attractive for the sake of fan service. Instead of being a well-written, interesting character, he spends a lot of time saying “…” while glaring, and every time this happened, I was confused of what I was supposed to be learning about his character. Was I supposed to be learning anything at all, or am I supposed to think of how nice he looks as he glares boringly at everyone? Regardless, it was a poor means of character development, and did absolutely nothing to enhance Levi’s character or add anything new. It’s lazy writing, not to mention it muddles the pacing of the story – which barely exists as it is. The second reason why No Regrets doesn’t really work as a good prequel spin-off is because the “new” character development Levi does get isn’t much to work with. Levi has to deal with his dilemma to kill Erwin and, while interesting, stems from… I don’t even know, that’s how little it’s mentioned. Levi, in the original series, is a surprisingly complex character, revealed through his facial expressions and speeches. In No Regrets, it seems like Levi doesn’t have a personality; his interactions with his comrades, Isabel and Farlan, are hardly interesting, and though there are fleeting moments that suggest some kind of bond between the trio, these are few and far in between, lacking any real emotion to make me invested in their camaraderie. What I do know isn’t much; Isabel looks up to Levi as a brother figure for a reason that was barely mentioned, and Farlan… I don’t know. I don’t have any words to describe him, that’s how bland he is. Worry wart, maybe? Bickering-Nuisance-to-Levi-Every-Couple-of-Chapters? But when these characters SPOILERS die and I find myself not caring because I don’t know jack about them, but instead interested in how their deaths will affect Levi, that isn’t a good thing. The original series is brutal, and every major and minor character fatality is violent and depressing. When the spin-off can’t render that same kind of power and emotion through the deaths of their “main characters”, it’s like they weren’t written to be genuinely cared for in the first place. Although, I admit that the way their deaths are handled is one of the few things this spin-off has done kind of well. By the conclusion of the most recent chapter, Levi is beginning to face the consequences of his decision first-hand, and perhaps the reason I found it so effective was because it’s reminiscent of a similar situation in the original series. Though I may have cared less, their deaths were a good – albeit late – means of showing Levi’s progression into the battle-hardened soldier that fans know later on. Regardless, it’s a pity to admit that Levi’s choice, along with his moral dilemma, is the only good, interesting part of No Regrets. While it gives audiences a sign of Levi’s potential to grow and be a more complex protagonist, the fact that it took seven chapters to get to this point – while doing nothing to supplement fans with anything else to be invested in – is ridiculous. Thing is, a series can’t be carried by a character’s moral compass or goals alone. Good stories and characters require more substance to drive it forward and make it compelling. What I mean is that a well-written character may be driven by their goals and aspirations, but it isn’t until their feelings and goals are challenged that they become conflicted. These situations add complexity, and the clash of differing ideologies makes them compelling and interesting characters, because a change can be tracked right away. From the very beginning of No Regrets, nothing lends itself to characterizing Levi in any real way, and throughout its entirety, Levi continues to be a blank slate, and no measures are taken to show fans anything new about him. It struggles to repeat what fans already know, but fails to give Levi any new, unique features or real justification for his actions and behavior in the beginning of the story. The discord between trying to convey who Levi becomes and who he was in his spin-off is apparent and makes it unclear as to who Levi’s supposed to be. No Regrets rides on Levi’s goal to kill Erwin, but there’s no real progression towards this outcome. Yes, I find his moral dilemma an interesting one, but there isn’t any clear mention of why Levi feels motivated to kill Erwin, or what spurs him to do so. The implications are there, but when I have to go out of my way to connect the dots without any insight into Levi’s thoughts, not only is a sign of poor story-telling, but also makes it difficult to pinpoint how Levi feels and why he acts a certain way. No Regrets suffers from a lack of establishing the basic foundation of their main character in the context of the story, and Levi’s barely existing voice falls on deaf ears. It lacks any real conflict or stakes in the beginning – when character motivations and ideologies are important and will affect them – so when situations do turn sour and the characters are forced to overcome them, it’s harder to become genuinely invested or sympathetic to the character’s plight. It’s unfortunate that this series was unable to capture meaningful plot points and character interactions as skillfully as the original series it is based off of, because Levi is a great character who had the potential to be a compelling protagonist if his back story wasn’t so poorly thought out. But to be honest, despite the fact that this spin-off has no discernible story or character motivations, it’s not all bad. Suruga’s art is pretty nice and crisp looking, and does a good job of conveying what emotions the characters do have. The art style is fairly accurate in its portrayal of recurring characters from the original series; although, the designs for Isabel and Farlan look like they were plucked from a different series entirely and inserted into No Regrets. Despite the fact that not all of the character designs are convincing and belong together, the action is pretty fluid for the most part, but over time, I found myself missing Hajime Isayama’s magical, distinct and memorable art style. 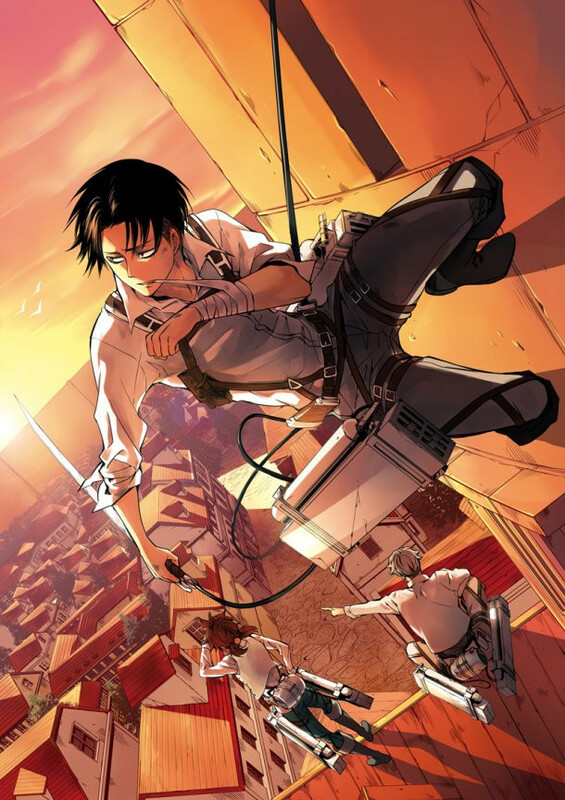 Some of the camaraderie between Levi, Farlan, and Isabel does manage to convey a sense of trust, and at times, the friction between Erwin and Levi is effectively conveyed and forces the readers to recall the circumstances of their tentative alliance. In short, my biggest disappointment with No Regrets comes from the fact that there aren’t any surprises. It barely touches on what fans do know about Levi to make him an interesting character with depth, and fails to give them anything new to ponder. I’d say that No Regrets is still a pretty good read, and one that would probably be worth it for Attack on Titan fans interested in the lore of the series. It may not offer much in real character development and story, but the art is pretty good, and if anything, Levi’s somewhat random moral dilemma and the weight of his choice crashing down on him are the only good parts worth reading. But if you go in thinking you’ll see Levi in an entirely new light, No Regrets won’t quite meet your expectations. no, the main story wasn’t written by Iyasama. The spinoff manga was adapted from a visual novel written by Gan Sunaaku. I don’t disagree that some spinoffs can be canon. Plenty of video games have spinoffs that are canon to the story, but I don’t think that’s the case with this particular one. It’s disappointing to me that this spinoff had the potential to feel like a canon story but failed because it lacked depth for me. I’ve found it’s a common misconception to tag “No Regrets” as created by Isayama specifically; he may have had some say on its development, but it was written and illustrated by other individuals, not him. Isayama is both the artist and author for the main series. He has assistants and editors working alongside him, but all in all it’s his main work. Disappointed af with this spin-off. Levi’s hood friends were drawn poorly and cliche, they didn’t fit the german facial structures Isayama worked on, to produce distinctive characters, alongside their personality. Yeah. As I mentioned in the review, Levi’s friends weren’t very interesting, which is a shame because Isayama has such a knack for writing strong, memorable characters, and the fact that these characters weren’t written strongly is a huge damper on the point of this story. The more time passes, the more bothered I am by the spin-off to be honest. It just had the potential be good, but it didn’t really achieve that. I agree, I found this spinoff pretty underwhelming tbh and I wish the characters were alot more compelling. It’s a shame that it’s not very good since it’s the only one I was considering canon, but after reading it I definitely don’t. I don’t know if Isayama confirmed if it was a part of the story (I hope not since this was not a remotely interesting backstory), but even if he did I wouldn’t read it as canon to the main story. Which at this point I think I’d prefer it if the spin-offs were over the top and goofy, because the ones that try to take themselves seriously aren’t very good in the face of the original series. Also if this spinoff was supposed to show some reasons why Levi would trust and follow Erwin, well there aren’t enough scenes of them really connecting as people for me to buy that relationship or Levi’s change of heart at the end. Especially if he seemed so obsessed with killing Erwin that he joined the Survey Corps to get close enough to do it. Levi spends most of his time interacting/plotting with his two friends anyways. Also the subplot with the trio trying to find the documents was kind of weak and uninteresting. I tried to brush this off as not being canon either but I guess the fact that it’s already been adapted into a comic and now a two part animated OVA (gotta milk the cash cow I suppose) sort of makes it harder to ignore. I agree. When it was first announced I was under the impression that it would show why Levi came to trust Erwin so much that he will follow every order without question, but here the story’s hopelessly muddled by his random obsession to kill him, and because of it there’s no room left to interact with each other and build the foundation for that trust in the first place. I had actually forgotten that the documents were part of the plot, that’s how much I didn’t care about it. Do you remember what the documents were for by chance? Because I literally have no clue, hah hah. With the announcement of the OVA, it’s definitely making it harder to ignore, but at the same time, it’s just reaffirming that I don’t consider it canon. Unless an OVA is deliberately created to be canon (such as Izumi’s backstory OVA in Fullmetal Alchemist Brotherhood, a backstory that was already alluded to in the actual series), I usually don’t consider it canon and just watch it to enjoy it. But with how much I didn’t enjoy Levi’s spin-off I doubt I’ll even watch the OVA. I’m just going to wait for the original series to reveal his backstory in full (which is already way more interesting than the spin-off that’s for sure). .
the reason why there wasnt much character development for levi was cause his past is revealed in the original story arc, so to avoid unnecessary spoilers, no regrets was made only for the purpose of milking the series. That’s a valid point. We get his full back story in the actual story (which is way more interesting and relevant than anything this spin-off can muster), and so while they would want to avoid spoilers, I don’t think of character development needs contain spoilers to at least develop the character in a meaningful way. Levi doesn’t have any personality, and I think the author (Sunaaku) could have done a better job of writing Levi’s character. Avoid spoilers, yes, but also give fans something new to think about. It’s unfortunate that this spinoff amounts to so little and simply milks the series, but that’s what happens when the story and characters are so poorly written that it contributes nothing at all. I thought the spin off was fine, it definitely could have been longer. You know, something to explain why Lobov came to them in the first place. I think it’s only mentioned once how “popular” they are underground. Although if you read the special chapters, Farlan talks vaguely about how he joined up with Levi. When I heard about this spin off, I expected to see more of his criminal life they alluded to in the main story. But for some reason, they were trying hard not to show much about it. Avoiding spoilers is not a good reason for it. I’ve seen the recent chapters, Levi’s back story stops around his preteen years. And to be fair, there were only a couple of pages devoted to it. I wanted to know more about his, and others, tough life in the Underground. I thought Farlan was ok, but I really liked Isabel. She had this lively personality that just screamed “I’m gonna die when I meet a Titan.” 😦 I liked how she began embracing the Survey Corps ideals’. Compared to the other two, she seemed more open minded. I was really excited to hear about the ova, part 1 was great. But part 2 was a complete let down for me. It seemed like unnecessary changes to me. Particularly at the end where they change how many Titans he kills. It waters down his abilities, especially since this supposedly takes place 1 year before the main story. One year is a long time, but I don’t think it’s enough to suddenly become the best. All in all, the many changes in part 2 made if seem like a different story/character. I, unfortunately, didn’t enjoy it. I had very high expectations from the spin-off and since it didn’t really meet those expectations, I had a hard time liking it, but I can understand its likability for other fans. I think that, had they devoted more time to his criminal life in the Underground instead of trying to avoid spoilers, it could have helped develop Levi’s character as well, which would have been nice since he’s a pretty boring protagonist in the spin-off. I also found the OVA’s to be disappointing, well at least the 2nd part. Not only were his abilities lackluster, but I was also surprised that his friends’ deaths happened off-screen. It’s one thing when a minor character like Marco dies, but when you have Levi’s best friends, the people he relies on, suddenly die off screen without any acknowledgment, that’s not good. It was also one of the parts of the spin-off that I thought was done remotely well, so the fact that we don’t see it in the OVA is an example of a negative change that makes it have less of an impact.